Express your Mail! Printed envelopes keep your brand in view! Reinforce your company's image with every piece of mail you send, use Deluxe' customized window envelopes, mailing envelopes and confidential envelopes as essential tools for your business success. Quote Promotion Code: GK730 during checkout. Business envelopes come printed with your name and address, giving your business a professional look while saving you time. 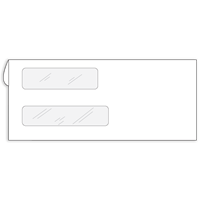 Keep your information secure with our confidential envelopes. The dark inside tint prevents people from seeing your private information. 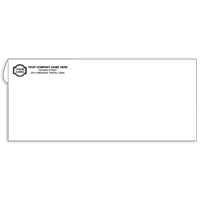 These standard size envelopes are perfect for many of your mailing needs. Make your brand stand out by adding your custom logo. 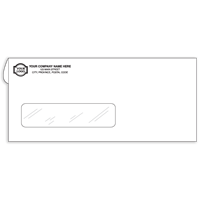 Choose from a variety of envelopes to fit all your business needs. 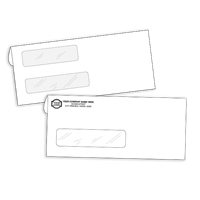 We offer everything from companion check and form envelopes, to shipping envelopes, to return envelopes and many others! *Discount valid on your first order of cheques, deposit tickets or envelopes. Your discount will be applied after your order has been completed, before final billing. * Prices shown reflect this promotional discount. Offer cannot be combined with any other special offer or promotion.Prices subject to change without notice. © 2016 Deluxe Enterprise Operations, Inc.